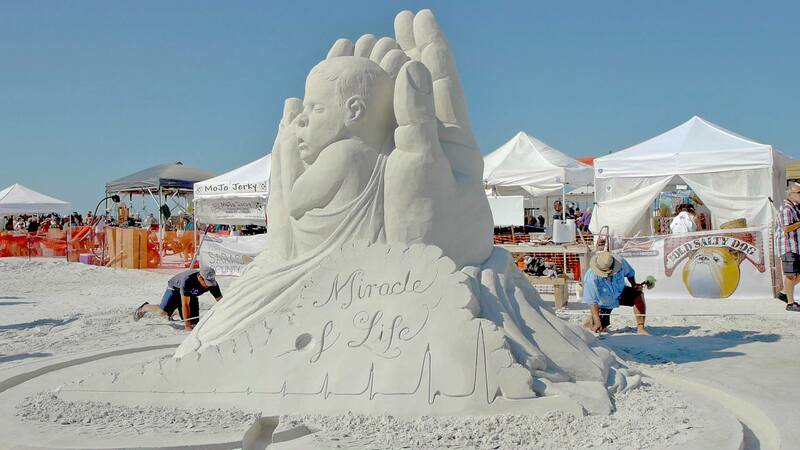 Both a sand sculpture and a baby in the womb are fragile masterpieces, which are both shown in a powerful sand sculpture called “Miracle of Life.” John Gowdy and Jan Zelinka won the People’s Choice award last week in the Siesta Key Crystal Classic, a Master Sand Sculpting Competition held annually in Florida. In the competition, sand sculpture artists create their work over a 7 day period. The “Miracle of Life” sculpture is a reminder of the fragility and beauty of human life. 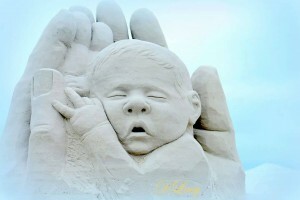 The sculpture, a sleeping baby held safely in the hand of a master creator, reveals a picture of the miracle that life is. Yet its creation from sand that can be so easily destroyed, likewise, holds a reminder of the fragility of life which can itself be so easily destroyed by choices. With its striking details, down to the fingernails of the hand holding the baby and the image of a heartbeat as a hospital machine might record, the sculpture shows a striking and vivid picture of life, which was a favorite of many who saw it. Others called it “beautiful,” “awesome,” “gorgeous,” and commented how it deserved to win the award. Gowdy, one of the sculptors, is a career firefighter in New Jersey, who has won numerous awards for his art. Clearly, he has given us another picture of the fragility of life, the beauty of life–all in the hand of a master creator who cradles his child in safety. The poignancy of this sculpture will outlast the physical existence of it, as it is now embedded on the hearts of many. Whether Gowdy and Zelinka intended to make any statements about life and abortion in this work is so far unknown but the reality shines through the sand, and offers a unique and powerful picture of life.